The Senate committee on public order and dangerous drugs conducts a public inquiry on the death of Albuerra, Leyte Mayor Rolando Espinosa Sr. on November 10, 2016. “I had to believe the story of the police because they are my subordinates and I am responsible for their deeds… Ako yung chief (I’m the chief)… What [they] do is my ultimate responsibility,” Pres Duterte said in his speech during the 80th founding anniversary of the National Bureau of Investigation (NBI) in Manila. The AFP PNP and NBI should be reminded that the NUREMBERG DEFENSE is unavailing once Duterte is already out of the loop. “Judge nga ang pinagtanungan ko e. Ang krimen ginawa sa Las Vegas ” TITO Sotto said in an interview on Tuesday. “Kagaya ko madalas akong maimbitahan, ang nagbabayad ng kinakain ko ay yung nagimbita. Ang ibig sabihin ba magprisinta ako na ako na magbayad kasi senador ako baka ma-charge ako? 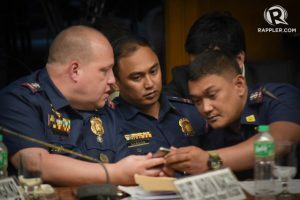 Katulad nun, inimbitahan ni Sen Pacquiao si Gen. Dela Rosa,” he said. “Anong krimen ang pinagsasabi nitong gagong ‘to?” Rody was heard asking. Ombudsman Conchita Carpio Morales has ordered the dismissal of Sen. Joel Villanueva, aka Tesdaman, for allegedly misusing his pork barrel funds when he was the representative in the House of an anticorruption party-list group Citizens’ Battle Against Corruption (Cibac) in the House. Duterte accuses AMLC, BSP of protecting money launderers. Speaking at the anniversary of the National Bureau of Investigation, the President chided officials of the BSP and AMLC for being uncooperative with the Department of Justice in its investigation of the financial transactions of suspected drug personalities. Unlike the BSP and the AMLC which the President has taken to task, he lauded the residents of the Libingan ng Mga Bayani for their welcoming silence in his controversial decision to inter the remains of his idol, former President FM in their subdivision. The House of Representatives will not be a rubber stamp, but if President Duterte needed it, he would be allowed to suspend the privilege of the writ of habeas corpus, Speaker Pantaleon Alvarez said on Monday. “The rule of law and the obedience of the law are just principles of the law and they are really good if everybody follows. The problem here is, there is no obedience of the law, and sometimes the rule of law becomes a stupid proposition,” President Duterte said at the NBI Anniversary the other day. 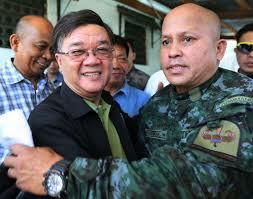 One reporter asked the President if ’twas true that he threatened to sue his ex-wife of the crime of Illegal Logging. “Ah, oo kasi tinakot niya ako na kung hindi ako titigil sa panchi-chicks ko, puputulan….” he replied. Senator Leila De Lima has admitted her romance in the past with her former driver and bodyguard Ronnie Dayan, describing it as “frailties of a woman,” GMA newsonline reported on Monday night. “Sigue, magtiaga pa tau. Aaminin na n’ya lahat ng mga sinabi ni Presidente. Pag ininterview ni Boy Abunda yan, si Warren ang aaminin. Kapag si Jessica Sojo, si Jonel naman…..” Sec BMW remarked. “Donald is like a good French wine. He doesn’t like to be moved and traveled.” Ivana Trump in an interview said. Barring unforeseen impediments, President Duterte would be flying to Lima, Peru, this week for his second interaction with world leaders at the Asia-Pacific Economic Cooperation (Apec) meeting, according to Presidential Communications Secretary Martin Andanar. — Senator Panfilo Lacson on Sunday noted a pattern in the separate police operations which led to the deaths of Albuera Mayor Rolando Espinosa and two alleged members of the narcotics ring of his son, Kerwin. “It seems that only one funeral service company is told to standby before any operation is done on the Espinosa Gang. Itatanung ko kung magkanu ang cut ni Matira at ni Marcos.” Lacson said explaining his pattern theory.